Warm up your box of chicken stock in a pan. Turn down to med.heat. Add your chopped onions in the pan with a bit more olive oil. Cook about 5 minutes. Add in your garlic and mushrooms and cook for 5 more minutes. Stir gently. Add in your wine. Stir and reduce about 5 minutes. Add in your rice. Stir well. Add in your chicken stock. Nestle your chicken in to the rice. 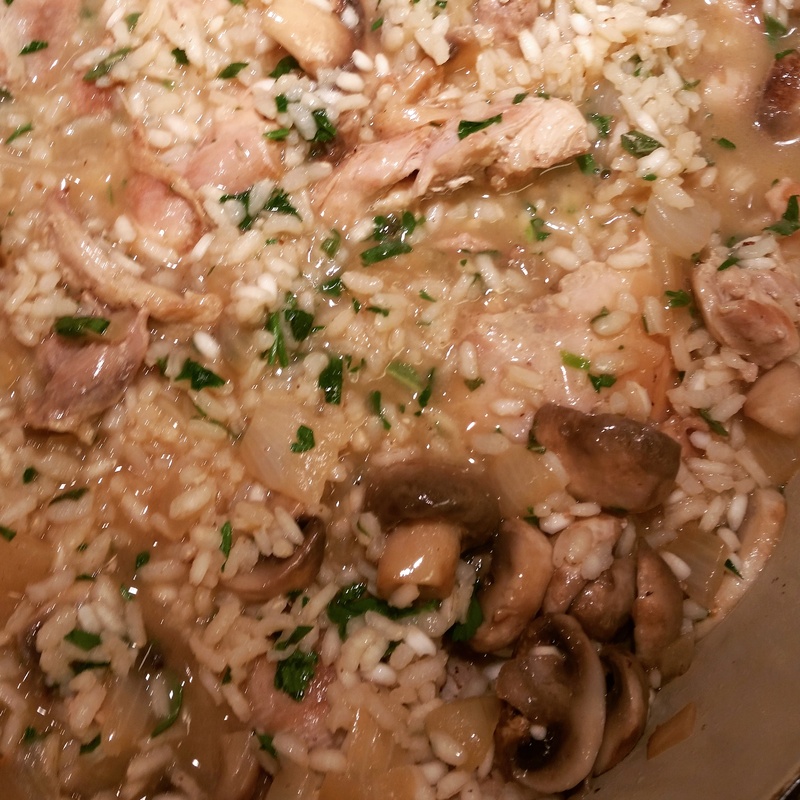 Turn down to med-low heat and cook rice and chicken until cooked through, about 30 minutes. Rice should be soft and chicken should be falling apart when you stir the mixture at the end. Stir occasionally to prevent rice from sticking to the bottom. Add the herbs and half and half in at the end. Stir to combine and serve with crusty bread and a side salad or another veggie. Thursday- Chinese Night with Miss Mandy! Friday- Family Night Out- Greek? Mexican? Indian?